Submitted 6 months 1 week ago by hunting north. Barrel: 7.5" 4150V Chrome Moly vanadium steel, phosphate coated and chambered in 5.56 NATO with a 1 in 7" twist. Pistol-length gas barrel is finished off with a PSA 7" Lightweight M-lok Rail, a low profile gas block and an A2 flash hider. Upper: Forged 7075-T6 A3 AR upper is made to MIL-SPECS and hard coat anodized black for durability. Featuring a mil-spec finish, these uppers are made for us right here in the USA by a mil-spec manufacturer. Bolt: Bolt is made of Mil-spec shot-peened Carpenter 158 steel. Gas key is secured with grade 8 fasteners and staked per mil-spec. 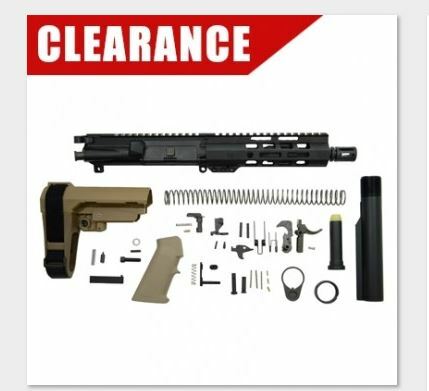 Lower Build Kit: A high quality lower build kit with everything you need to assemble your AR-15 lower into a pistol. Features Mil-spec single stage fire control group, FDE Classic A2 Grip, USGI Trigger Guard, and black oxide coated hammer and trigger springs. Also includes SB Tactical SBA3 Adjustable Pistol Brace, castle nut, latch plate, carbine buffer spring, 5 positioning mil-spec buffer tube, and standard carbine buffer.